Perched on a cliff overlooking Kolitsani Bay, Kolitsani View Hotel features a sun terrace with a pool, a poolside bar and a hot tub. 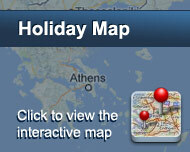 It offers air-conditioned accommodation with free Wi-Fi, just 1 km from Mylopotas Beach. Enjoying views over the Aegean Sea or the garden from their furnished balcony, the colourful rooms of Kolitsani have a satellite TV and a fridge. Each is equipped with a safety deposit box and a hairdryer. Continental breakfast is offered daily at the traditionally decorated dining area or at the terrace. Drinks, cocktails and fresh juices can be enjoyed at the poolside bar throughout the day. Guests can relax at the sun loungers by the pool or at the hot tub, while enjoying panoramic sea views. A small library is also featured in the property. Είστε ιδιοκτήτης ή διευθυντής στο KOLITSANI VIEW HOTEL; Εγγραφείτε τώρα για δωρεάν εργαλεία, που μπορείτε να χρησιμοποιήσετε για να βελτιώσετε την καταχώρησή σας και να συνδέσετε την ιστοσελίδα σας και το σύστημα κρατήσεών σας.